Earlier this week I came across this article entitled “Will You Be Taking a Vacation in Virtual Reality This Season?” and I found it was quite entertaining. MIT Media Lab founder Nicholas Negroponte pictured himself being transported to the Swiss Alps from his own living room in Boston already in 1995. Even though virtual reality cannot compete with the real experience of actually going somewhere, it makes a lot of sense that a growing list of airlines—including Etihad Airways and United Airlines—and vacation spots are becoming more and more involved with VR technology. These types of digital options are able to give customers a more detailed experience of their potential destinations and potentially make them want to visit the real location. Some of them can be viewed online—via YouTube and Facebook—but others do require special viewers—such as Oculus Rift or Google Cardboard. On a different note, VR can also give access to unlikely destinations and places off-limits to ordinary vacationers. In any case, VR is getting closer to the real deal. What is also really interesting to me is the fact that Sue Thomas, author of the blog Technobiophilia: Nature and Cyberspace, concludes the article by bringing up digital scent technology, and how it still is “the Holy Grail of virtual reality” nowadays. This entry was posted in Items of Interest on December 21, 2016 by Marti Massana Ferre. I was recently watching the Late Show with Stephen Colbert and, in one of his sketches, he mentioned something that I personally had not realized about yet: Donald Trump will be able to send unblockable texts to every American starting January 20th. I am particularly curious to see how things are going to turn out from here on out, taking into account we are talking about a President-elect who has shown no hesitation when it comes to firing off tweets on social media. Guess which one of the above cannot be blocked. However, it is also true that all 90 character WEA text messages are issued through FEMA’s Integrated Public Alert and Warning System. With that being said, these texts must pass through at least one more layer before being released throughout the Nation. Moreover, access to this system usually takes two different training courses, apparently. As Jake Swearingen points out in this article, getting access “requires some time and effort […] it’s hard to imagine Trump (who doesn’t use a computer) learning how to do on his own. Which means he would need the help of his support staff to issue a WEA”. In any case—and taking into account how the electoral campaign and the election went—I am sure this will also be another controversial topic come Trump’s presidency. This entry was posted in Items of Interest on December 7, 2016 by Marti Massana Ferre. Here is a TED Talk from Sherry Turkle, whom Prof. Gold brought up by the end of the class. She is a Professor of Social Studies of Science and Technology at MIT. In her research, she explores the ways we are connected with each other and our relationships with technology. She analyzes how we turn to technology to engage with our communities in ways we can comfortably control—even though we might not actually be “comfortable” with it—and also how we get from connectivity to isolation at a more introspective level. At one point, she goes on to say that “I am still excited by technology, but I believe, and I am here to make the case, that we are letting it take us places that we do not want to go”. This entry was posted in Items of Interest on November 30, 2016 by Marti Massana Ferre. I had already been making efforts to look for surveillance cameras and speed cameras at intersections and in the subway, cell towers, dishes, analog TV antennae, and various mystery boxes on telephone poles. Until Verizon convinced me to switch from copper to FIOS a couple of years ago (very grudgingly, and only after resisting for years and then deploying the “executive carpet bomb” complaint technique on Verizon officials – it works, btw) it was in my personal interest to be informed about POTS service in the city, and in particular the contents of two green-gray junction boxes on my street. After the switch, I began to look more carefully at where FIOS cables in the area were coming and going. But Networks of New York—and this course in general—has made me much more observant of the wireless and wired infrastructural environment, both in the city and in the countryside, where cables and lines are easier to notice (I also keep an eye out for lightning rods on old barns). This morning on the bus I began to pick out a number of wireless surveillance devices that Burrington includes in her field guide: the flat square antennae that enable street and traffic surveillance cameras to talk to each other; microwave antennae; and some unremarkable-looking antennae bolted to streetlamps that didn’t seem to be connected to any other device. So apparently Myrtle Avenue is abuzz with data exchange at all times. But it’s a conversation that none of us can eavesdrop on—at least, not without the right tools. What seemed before to be a basic, rather linear setup of cameras and transmitters at intersections now feels like a cloud of surveillance that I move through, at all times, except maybe (I hope) when I am inside my apartment sleeping. Still, it’s easy to tune out because it’s not very visible and doesn’t interfere with my daily activities. A quarter mile away, however, that’s not the case. For the past couple of years, portable towers with floodlights and cameras set up on the grounds of a large NYCHA complex by the NYPD make their presence very well-known at night. Generators emit a continuous rumble and the light undoubtedly intrudes into the rooms of surrounding apartments. The towers were put there presumably because the area had experienced some persistent low-level crime—and occasionally, shootings. But they seem to have substituted the limited one-way communication capacity of machines for any human presence, whether of police or security guards, or anyone who could connect with the community, and facilitate interpersonal networks. Now, it’s reasonable to assume that many residents would gladly trade the intrusion of the light towers for a safer environment. But sometimes when I pass these towers I try to imagine what it’s like to live every day under the eye of normalized police surveillance: the visibility is surely as much, or more, of a deterrent as the lights and cameras themselves. (And yet, by now these familiar structures might as well be permanent neighborhood fixtures.) I also try to imagine what it’s like to live in an environment where personal safety is often at risk—that’s also an intrusion. And, I think about the difference between subjecting people to pervasive but low-visibility surveillance versus that which is localized but meant to be noticed and to encourage certain behaviors in response. Is one mode more insidious overall? Does one have more potential to erode public trust in legal and municipal institutions? This entry was posted in Items of Interest and tagged FIOS, NYPD, POTS, surveillance, wireless infrastructure on November 14, 2016 by Lisa Hirschfield. I was checking out manhole covers on my way to work and noticed one abbreviation (“DWS”) that I later searched for online. Here’s a handy Wikipedia page on manhole cover abbreviations in NYC, and some of them link to pages about the companies or public works divisions they refer to. But some covers only indicate which ironworks made them. Would these be leading to dedicated ducts for the respective BP’s offices? And if so, are they access points for internet, cable, or something else? Vacuum tubes? Escape tunnels? There’s also this website, with great photos. This entry was posted in Items of Interest on November 14, 2016 by Lisa Hirschfield. Our class discussion today — in particular the implications of placing organic life and inorganic objects on the same plane of ethical consideration, the Internet of Things (and “smart houses”), and whether or not human-programmed artificially intelligent objects can have any kind of agency independent of human activity — made me think of the 1977 sci-fi horror film Demon Seed. I noticed that a rather pessimistic quotation from Alfred North Whitehead is included on the series webpage: “The major advances in civilization are processes that all but wreck the societies in which they occur” (epigraph to Marshall McLuhan’s The Medium is the Massage). Demon Seed would certainly bear out that sentiment, but Whitehead’s less doom-laden thoughts about the world as “webs of interrelated processes” have heavily influenced Jane Bennett and Jennifer Gabrys (and most likely other folks we’ve read). In their writing, respectively, on interactive, “agentic” assemblages of organic and inorganic matter, and the way connectedness and environments might mutually constitute or “program” each other (and the ways all of these things “program” human experience of environments), they have explicitly drawn on Whitehead’s “approach to ‘experience’ as something that is embodied across human and more-than-human subjects” (Gabrys, “Sensing an Experimental Forest: Processing Environments and Distributing Relations,” Computational Culture. September 2012). As I understand it, this notion of embodiment — whether it operates at an atomic level; or as a network of electronic sensors; or in and through animal, vegetable, or mineral matter — is also the basis for their ecologies of connectivity. 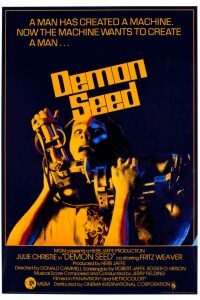 If you haven’t seen the film and you need to blow off some mental steam before the election, I recommend Demon Seed, especially in light of what we’ve been reading in the past couple of weeks. Just keep in mind that as an audience member you will be compelled to reenact its 90+ minutes of creepily pan-optical, clinical surveillance of Julie Christie (i.e. voyeurism, with some unremarkable 1970s horror-flick misogyny thrown in for good measure). Good times! This entry was posted in Items of Interest and tagged 2016 election, A.N. Whitehead, Anthology Film Archives, Demon Seed, horror films, Internet of Things, Jane Bennett, Jennifer Gabrys, Julie Christie on October 18, 2016 by Lisa Hirschfield. The show was incredibly wide-ranging — everything from a plastic mouth-expanding “communication prosthesis” to Metrocard machines — but a majority of the objects involved some form or use of mechanical or digital technology. While I was starting the first chapter of Program Earth I thought of one piece in particular: a tree listening station at which passersby in Kew Gardens (London, not Queens) could listen to the inside of a tree (it was recreated in the gallery with a recording, video, and headphones). It was great to discover that the whole show is accessible online now — I am seeing things that I either missed or was too overwhelmed by sensory input and crowds to take in on the two occasions I went to see it. Here’s one example of something I missed in person, which brings The Peripheral to mind in more ways than one. This entry was posted in Items of Interest and tagged MOMA, Program Earth, sensors, trees, user experience on October 17, 2016 by Lisa Hirschfield. In our discussion of rhizomes and rhizomatic properties, I was reminded of a book by Daniel Spoerri, An Anecdoted Topography of Chance (1962, 1966). Spoerri, a participant in the Fluxus movement, embarks upon a literary experiment in which he catalogues everything that happens to be lying on a blue table in Room 13 of the Hotel Carcassone at 24 Rue Mouffetard in Paris, where he was staying. It’s a “topography based on chance and the disorder that I snared on October 17, 1961 at 3:47 p.m.” (xv-xvi). The book’s front endpaper and inside jacket include a rudimentary hand-drawn map, which delineates the shape of each object. “Each outlined object is numbered, and the game I suggest is to choose a shape on the map and look up the corresponding numbered paragraph in the text” (xvi). The anecdotes consist of a history of the object and how it came into the author’s possession or vicinity. Many of these anecdotes spin off into other contexts that can only be related to the objects via associations Spoerri makes in his memory or imagination. The publisher’s statement warns that the Table of Contents cannot be used as a key to the map. In other words, the reader must use the map to find her way around the text, or invent her own game for reading (xiii). The publisher also announces that supplements to the original (English) text will be issued “at irrregular intervals” and invites readers not only to subscribe, but to “send in contributions to these supplements in the form of further annotations and comments on the one hundred and one articles in this text…particularly…relating to the IV, V, XI, and XIX arrondisements of Paris, in which much of the action in this book takes place.” Thus, the reader will become a participant in sketching out a spatially- and temporally-layered topography based on his own knowledge, associations, and experiences. Emmet Williams, translator of the English edition, has also included his own annotations and “anecdotations” of the text, which pose questions about the objects Spoerri describes, refer to his own tangential experiences loosely related to the objects, or comment on Spoerri himself. Spoerri adds additional notes to his anecdotes as well. The book is a playful illustration of what something like Deleuze & Guattari’s connected rhizomatic dimensions might look like, as much as it would be possible to capture such things in the printed word. have some Orange Pekoe left. on our trip to Nice (No. 31). 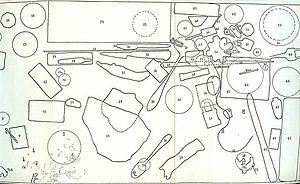 This entry was posted in Items of Interest and tagged A Thousand Plateaus, Daniel Spoerri, Fluxus, Paris, Rhizomes, topographies on October 16, 2016 by Lisa Hirschfield. 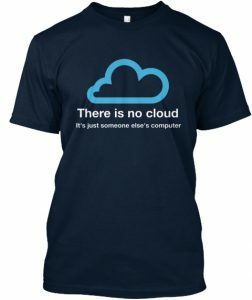 It’s just someone else’s computer. This entry was posted in Items of Interest on September 20, 2016 by Jason Scaglione. This entry was posted in Items of Interest on September 12, 2016 by Lisa Hirschfield.